When internet first because widely used, which was around the year 2000, most hotels did not have their own website and for most people the only way to book a hotel was to go to a travel agent. The travel agents would look up the hotel information on special databases such as “sabre” and another one which a I can’t remember and make the booking for you in their office. I remember going to Thomas Cook travel agent in the 80s and this was the modus operandi. After spending 20 minutes with a “nice man” you would leave the Thomas Cook office clutching your “Traveller’s Cheques” and details of your hotel bookings along with your tickets for a “Charter Flight” which was supposedly a cheap option, this would cost about 10 times what it would cost today (2017). Here I must admit to lying, until 1991 I never stayed in a hotel, I would sleep in fields or under motorway bridges if I was hitch-hiking. Booking.com started in 1996 but it took them until about 2005 to become a massive worldwide company. They now have over 1 million properties worldwide and they are now a household name synonymous with hotel bookings. The same as Facebook or their predecessor Friends United are associated with social media. Since 1998 I have been the webmaster of some reasonably well visited travel websites. To try to monetize these sites I signed up to the booking.com affiliate program, this was in 2007. In order to get commission from a booking.com link it is necessary for the web surfer (us) to click on a link and then go immediately to book a hotel or in other words the web surfer has to book a hotel in the same session. The cookie expires as soon as the user closes the browser. The next paragraph is boring unless you have a travel website. It basically says that all newspapers or travel websites would have to close down if they relied for their income on the booking.com affiliate system. Since 2007 I have sent booking.com 3039 clicks. This has resulted in 73 bookings which has earned 668 euros. That is 21 euro cents per click. Nowadays 21 cents per click is not too bad. The click-through rate is about 1 click per 500 impressions. So that means that the earning per 1000 impressions is about 10 cents. That would mean that a page with 1 million views per day could earn around 100 euros per day. My average google Adsense earnings are around 160 cents per 1000 views so the booking.com is 16 times less effective than Adsense. It may well be better to just put google Adsense ads on relevant content rather than using the booking.com affiliate system. On the Wikipedia page is says that booking dot-com spent around $40 million on adwords in 2011. (Who gave Wikimedia that statistic?) By the way anyone who uses adwords is not allowed to publicly discuss this? On the affiliate site it makes it look like the percentage comission is 25%. It is actually 2.2%. I just booked a hotel for a family for 1 night. The cost of the one night was 180 euros. Booking.com themselves charge hotels 15%. I recently tried their new responsive search box widget. The results are disappointing. I gave the search box 11646 impressions which resulted in 22 clicks, zero bookings and zero income. I eventually deleted search box widget after 32 000 impressions with zero income. the See image below. It would be much more lucrative to come to arrangements directly with hotels to get a commission directly. Booking.com charge the hotels 15%, they give you 25% of that which is actually 3.75% comision. However, if you don’t want the hassle of dealing directly with hotels it may earn you a very small residual income. If the income was better I would give them more prominence. Hotels themselves have let themselves be ruled by booking.com. In one way you can consider this a good thing. Beforehand most hotels had a chaotic booking system based on school exercise books with pencil ruled lines which contained all the booking information of their bookings and availability. 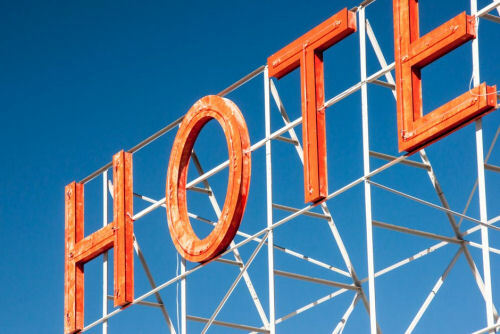 Booking.com offered a free system to coordinate all the bookings, prices and availability and in some ways provided a more level playing field. This has also been very attractive to the consumer. The advent of feedback pioneered by “Trip Advisor” has resulted in a system which favours the “guest”. However, in my opinion the story is not yet over. Hotels etc do not really need a third-party such as booking.com to control them. Someone will eventually offer a centralised source of information, prices and availability about hotels which hotels can buy into. The rate of commission will be much less than 15%. Maybe there will be a small cut for travel websites which is better than 10 cents per 1000 views but until that moment the booking.com partner affiliate system is a “get rich very slowly scheme. UPDATE: It has always surprised me how little I make on booking.com. Ten days ago (oct 2017) I clicked on my own affiliate link and booked a hotel for myself and I stayed there. I am not sure if this is allowed according to the rules so before making the booking I deleted all cookies and used a VPN to give me an ip address in the UK. Gues what? There was no mention of a booking on the affiliate statistics page. I doubt if booking.com are intentionally not giving comissions but I have proved to myself that their tracking system does not work as it should. I wonder how many other bookings were not tracked correctly.